Free T-Mobile Cell Phone Lot - Access to the lot is gained from Rental Car Road. Signs denoting the lot are located at the airport's entratnce. All drivers are required to remain with their vehicles.wait in your vehicle and ask your passengers to contact you via cell phone when they claim their luggage, then drive to the Baggage Claim area to pick them up. First 30 mins - Free; each 30 mins thereafter - $1; Daily max - $16. Daily Parking - Left of the airport entrance road, as passengers approach the terminal. Overhead signs indicate designated entrances. This short-term lot should be used for passengers leaving their car at the Airport for 24 hours or more. 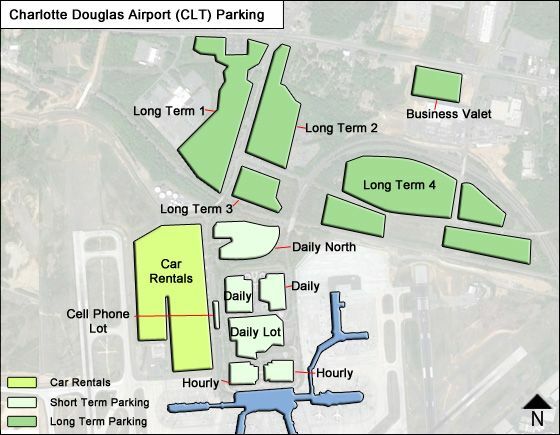 Daily includes a surface lot and deck and is located within walking distance of the terminal. Free shuttle services available at the shelters immediately adjacent to each lot. Fees: Each hr - $1; Daily max - $6. Each hr - $1; Daily max - $6. Flat fee - $10 (special one-time rate). Payment Methods: Parking attendants accept cash, credit cards and traveler's checks. Payment is made upon exiting the parking facility. For more information call (704) 359-4038 to speak with an attendant; or e-mail: [email protected] Emails are responded to within 24-hrs/ Mo-Fri.
- Allow more time to park, especially on peak travel days: Tues/Wed/Thurs, as well as Sundays and days before/after holidays are exceptionally busy. - Call 704-FLY-5555 for current parking conditions. - Follow directions of CLT Parking Attendants stationed in lots to assist parkers during peak times. - Know which parking option is best for you. what are long term parking daily rates?